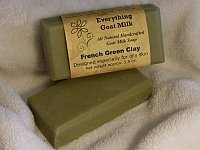 French Green Clay Goat Milk Soap has a variety of special ingredients to help with oily or acne-prone skin, including basil-infused olive oil, and eucalyptus, spearmint and tea tree essential oils. French green clay helps absorb extra oils from the skin, while the basil and essential oils are included for their acne-fighting properties. Ingredients: goat milk, olive oil, palm oil, coconut oil, sodium hydroxide (lye), castor oil, shea butter, avocado oil, montmorillonite (French green clay), fragrance, sucrose, sea salt, tea tree oil, basil. Net weight 3.5 oz.